Algonquin Young Readers, 9781616208004, 272pp. Apowerful story about family secrets, first love, the limits of forgiveness, and finding your way in the world. When fifteen-year-old Lucy Willows discovers that her father has a secret child from a brief affair, she begins to question everything she thinks she knows about her family. How could her father have betrayed them like this? How could her mother forgive him? And why isn’t her sister rocked by the news the way Lucy is? Lucy can’t bring herself to tell her friends, and when she tries to confide in her boyfriend, he doesn’t understand. Fed up with everyone around her and desperate for answers, Lucy runs away to Maine—the home of her mysteriously estranged grandfather—to get to the bottom of her family’s secrets and lies. Andrew McCarthy is the author of the New York Times bestselling travel memoir, The Longest Way Home. He is an editor at large at National Geographic Traveler magazine. He is also an actor and director. He lives in New York City with his wife, three children, two fish, and one dog. 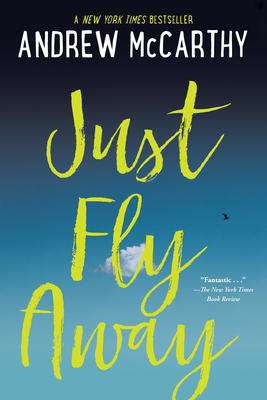 Just Fly Away is his first novel. You can find him online at andrewmccarthy.com or on Twitter: @AndrewTMcCarthy.